To schedule an appointment, complete the form below with your name, contact information, and appointment date request. 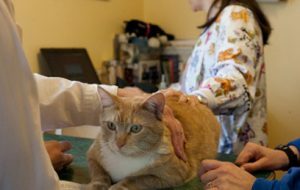 Please be sure to include any special needs such as requesting a house call, drop -off service or anti-anxiety medication for cats who do not travel well. A confirmation will appear after you click "Submit." A representative of our hospital will then contact you to confirm your appointment. We look forward to working with you! If your cat is having an urgent medical condition, please call our office rather than leaving a message here, also our emails are only checked during business hours, so please allow 24 business hours for a reply. Choosing the right company for your service is easy when you turn to us. We are honored to be your choice for excellent service that caters to your needs. Contact Us today. Copyright 2019 © Cats On Call Hospital INC. All Rights Reserved.